If ever there was an understated self portrait, it would be designer Thomas O’Brien’s description of himself as “basically a shopkeeper and a homemaker.” As the founder and President of Aero Studios, Aero, the iconic home emporium, Copper Beach, his and husband Dan Fink‘s charming Long Island general store, as well as a multitude of collaborations and licensed collections, O’Brien has been a leading proponent of modern American design since 1992. 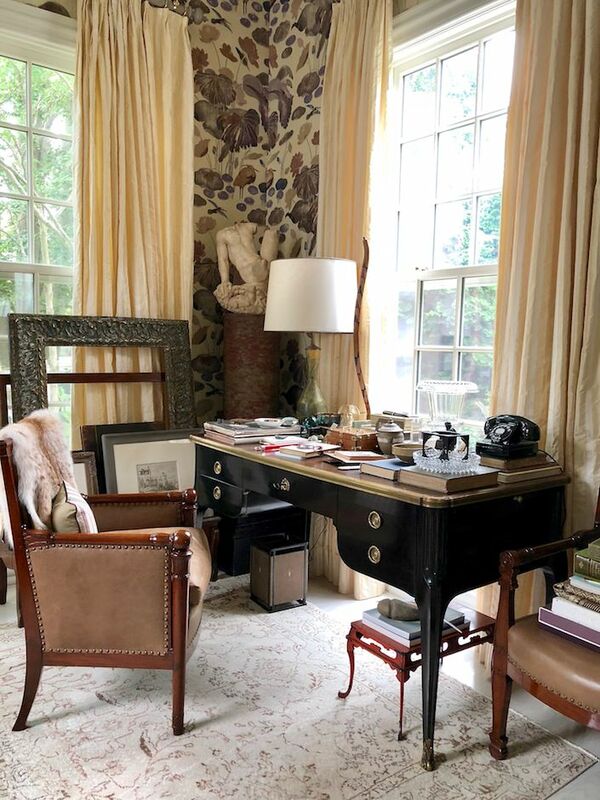 And nowhere does his aesthetic shine more, than in his two Long Island houses, the most recent chronicled in his new book, Library House. 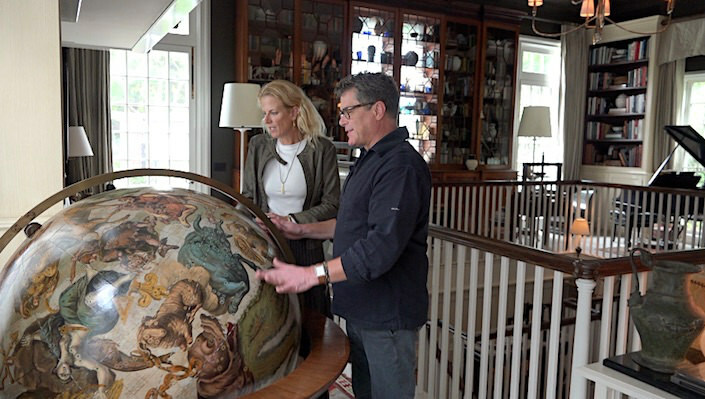 Tag along with Susanna Salk and me for a behind the scenes visit with Thomas in his Bellport, NY home. 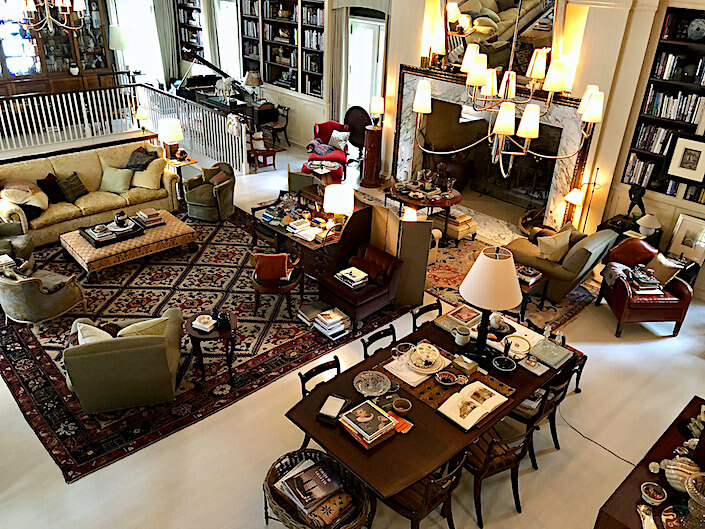 A collector for most of his life, O’Brien finds inspiration wherever he goes. And while essentially a private person, he has always been passionate about sharing his many finds. Early employer, Ralph Lauren, sensed he had “the bug,” seeing in him another future shop owner. 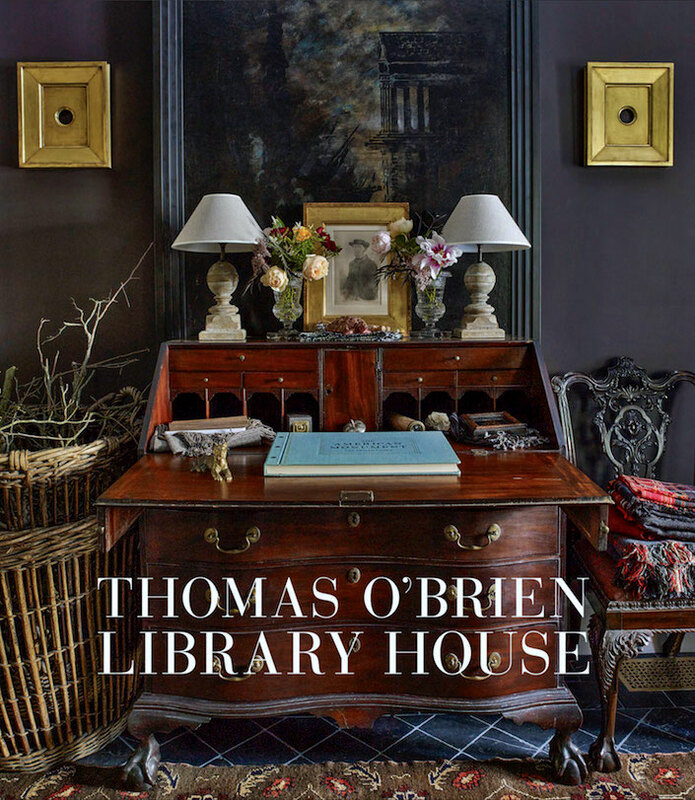 But what is especially fascinating about O’Brien is how his entire life – collecting, curating and creating – is so intricately intertwined. 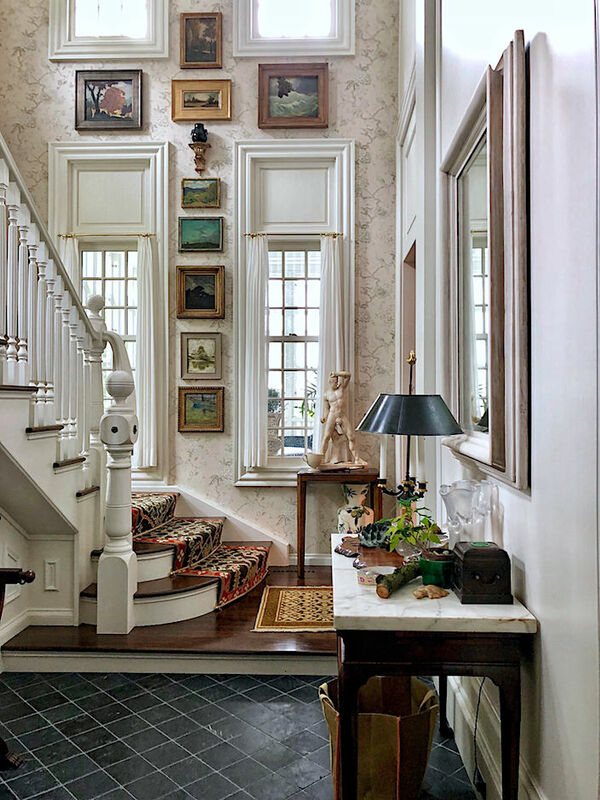 Much of O’Brien’s inspiration comes from the past and this is especially true for The Library, a house he designed and built from scratch to look as if had been assembled over generations. A singularly personal house, it is a place where stories past, present and future meld. Here O’Brien’s favorite things not only tell his own story, but help to inspire and create backstories for new products and designs. And it’s this same reverence for bringing history forward that connects Thomas with our video sponsor Reed & Barton, a brand grounded in American history (founded in Massachusetts in 1824). 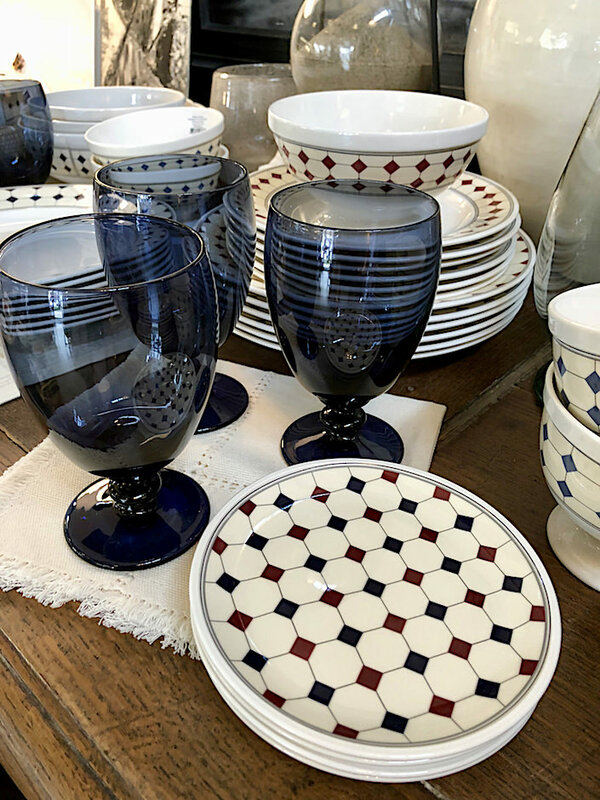 His latest collection for the brand, Maison Couleur dinnerware, comprising Diamant, Ardeche, Martine and L’hotel patterns, has a European pedigree, taking its style cues from a vintage French tile-pattern catalogue O’Brien once purchased from an antiquarian bookseller in Manhattan. 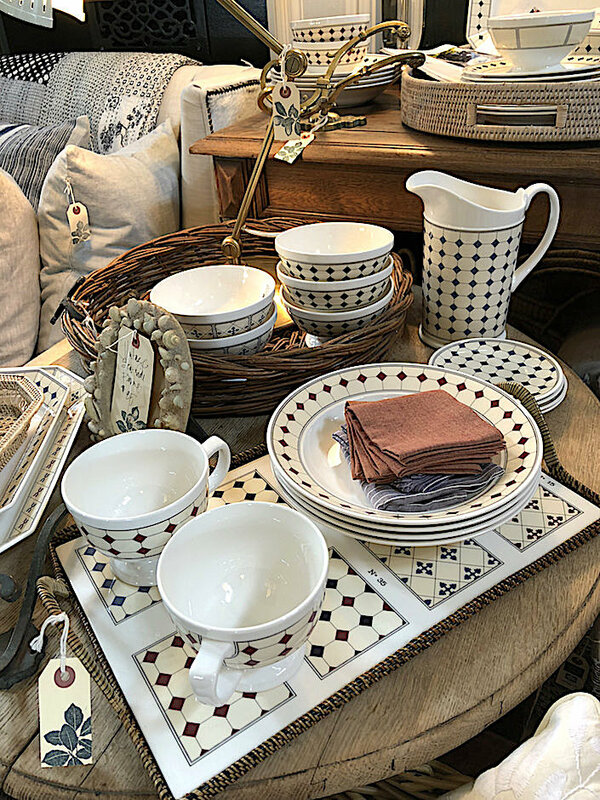 With timeless and easy mix-and-match patterns, from the diamond grid of Diamant to the polychrome quatrefoils of Ardeche to the refined Martine and serene all white of L’hotel, the pieces are perfect for relaxed everyday entertaining. 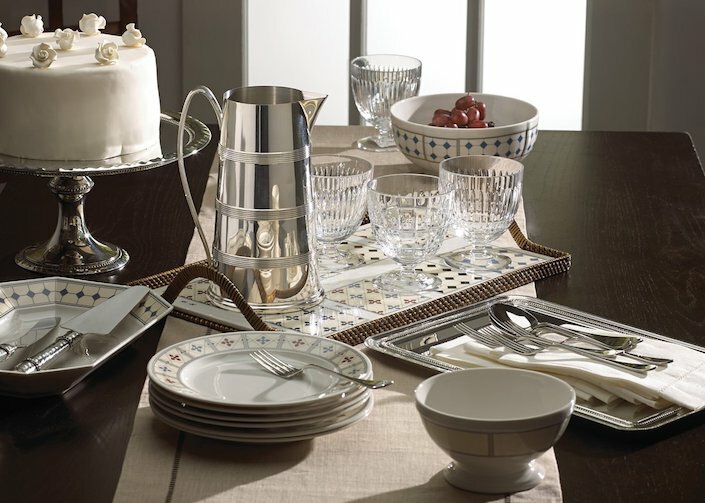 Melding effortlessly with his other collections for the brand, like the indigo glassware, above, or flatware, glassware or bar accessories, below, O’Brien transports the bygone charm and luxury of the past to the present day with a modern freshness. So thank you Thomas, we were thrilled to be a part of your inspiring and creative world! 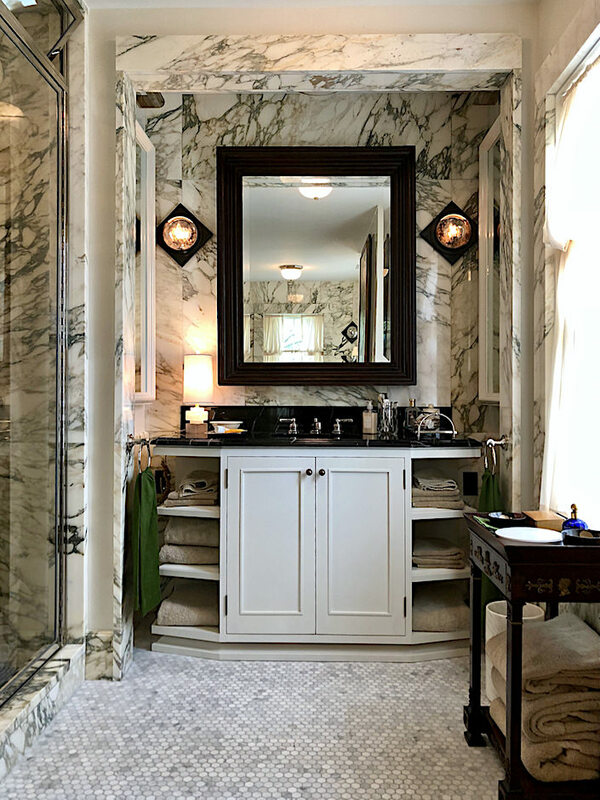 This entry posted in architecture, art, At Home with, books, design, furniture, garden, interior design, Quintessence video series, Stylish Shopping. 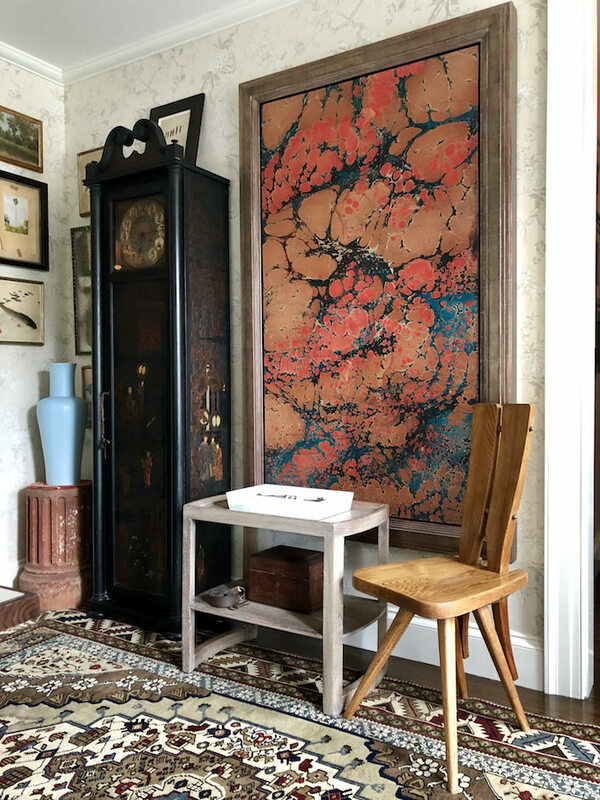 Entry Tags: Aero Studios, At Home with, Copper Beech, interior design, Lenox, Reed & Barton, Tabletop, Thomas O'Brien, Video Bookmark the permalink. TOB is one from the BEST New Stars !!! p.s. Thomas saved Bellport !!!! thomas o’brien is extremely inspiring ! ! ! 85 queries in 0.841 seconds.